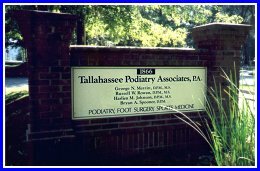 On behalf of the Doctors & Staff of Tallahassee Podiatry Associates, we would like to welcome you to our website. We appreciate your selection of our office to serve you and your foot health needs. The goal of our office is to provide the highest quality of foot care available in the Northwest Florida and South Georgia area. We have over sixty years of combined experience in treating adult and pediatric patients. We hope this website will provide valuable information to you about our office and how you can benefit from better foot health. The more you know about us, the more we can be of service to you in providing an important aspect of your total health care. Our office business hours are 8:30am to 5:30pm, Monday through Friday. The doctors of Tallahassee Podiatry also serve the community of Bainbridge, Georgia. Please call our office for appointments and any other information regarding this satellite location. The office telephone number is 850-878-6998. Directions to our office can be found in the Find Us section of this website. We accept many different types of health insurance and participate in many local health maintenance organizations ("HMOs"). Our doctors are available twenty-four hours a day, seven days a week. In case of an emergency after regular business hours, the doctor on call can be reached at 850-298-1205. Please leave a voice message or enter in the telephone number where you can be reached. During your initial visit with us, we will ask you to complete a patient information form for our office. For your convenience, you can print this form, and several others, directly from this website's document library and complete it prior to coming in for your appointment. Your first appointment with one of our doctors will include a detailed history and lower extremity examination as it relates to your particular problem. Though we are foot specialists, we are also concerned with our patients' general well-being and overall health. There are many systemic medical problems that may affect the feet. Often, your Podiatrist may be the first to diagnose or suspect conditions such as diabetes, arthritis, gout, poor circulation, nerve problems, or other conditions. Patients with diabetes are prone to develop serious foot problems and therefore, need to be under the regular care of both their Medical Doctor and Podiatrist. Routine foot care may not be covered under your Medicare coverage. If you are a Medicare patient, please read more in our Coverage section.